This dataset describes the environment, soil, and vegetation on nonsorted circles and earth hummocks at seven study sites along a N-S-transect from the Arctic Ocean to the Arctic Foothills based on data collected from 2000 to 2006. The study sites are located along the Dalton Highway, beginning in Prudhoe Bay, on the North Slope of Alaska. These frost-boil features are important landscape components of the arctic tundra. 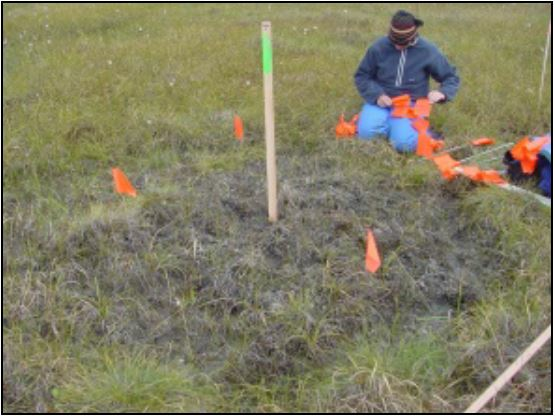 Data include the baseline plot information for vegetation, soils, and site factors for 117 study plots subjectively located in areas of homogeneous, representative vegetation on frost-heave features surrounding stable tundra. Nine community types were identified in three bioclimate subzones. Vegetation was classified according to the Braun-Blanquet system. This dataset includes four data files in *.csv format and three companion files in *.pdf format. This dataset describes the environment, soil, and vegetation on nonsorted circles and earth hummocks at seven study sites along a N-S-transect from the Arctic Ocean to the Arctic Foothills, Alaska, based on data collected from 2000 to 2006. These frost-boil features are important landscape components of the arctic tundra. Data includes the baseline plot information for vegetation, soils, and site factors for 117 study plots subjectively located in areas of homogeneous, representative vegetation on frost-heave features surrounding stable tundra. Nine community types were identified in three bioclimate subzones. Vegetation was classified according to the Braun-Blanquet system. Data File Information: There are four data files with this dataset in comma-separated (.csv) format. Frost_Boils_Environmental_Data.csv Comprehensive set of environmental characterization data for Frost Boil research plots including the descriptive site factors. Data Descriptions: The column names, their units, and descriptions for each of the *.csv data files are listed below. NOTE: Coded and scalar variables are followed by a description column (e.g. MICROSITE & MICROSITE_DESC). See legend companion file for complete list of coded and scalar variables and their descriptions. 4 to 118 DATASET_PLOT_NUMBER Column headings are all 117 plot numbers. The data values are Species Cover Classes (Braun-Blanquet cover-abundance scale): where r (rare), + (common, but less than 1 percent cover), 1 (1-5 percent), 2 (6 to 25 percent), 3 (25 to 50 percent), 4 (51 to 75 percent), 5 (76 to 100 percent). Frost_Boils_barredaj2006_Report.pdf Summary report of all the data collected, methods of collection, maps/plots etc. for the study plots. Barreda et al. 2006. Derived regional maps of these data will be used in regional models of fluxes of trace gases, water, and energy from tundra surfaces. In addition, a circumpolar vegetation classification resulting from these datasets would be highly desirable to extend the results to the entire arctic region. The vegetation associated with cryoturbated frost-heave features on the North Slope, Alaska was described by Kade et al. (2005) as part of the "Biocomplexity associated with biogeochemical cycles in arctic frost-boil ecosystems" project (NSF grant #0PP-0120736) from 2002 to 2006. The study sites spanned a latitudinal gradient from the Arctic Ocean (bioclimate subzone C) and Coastal Plain (bioclimate subzone D) to the Arctic Foothills (bioclimate subzone E) of Alaska. Bioclimate subzones and plot locations are depicted in Figure 2. 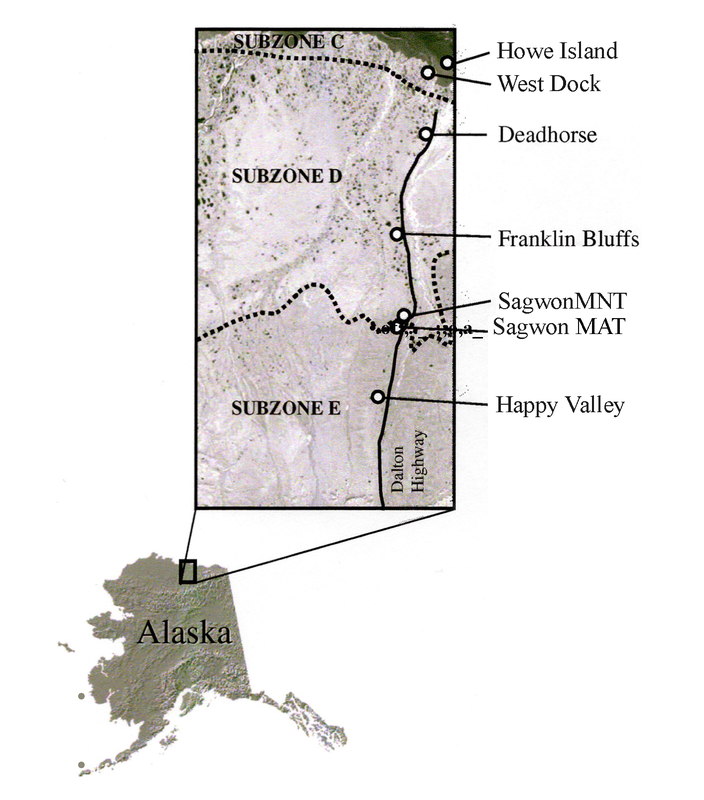 Seven study sites were established along a N-S-transect, with a total of 117 relevé plots on frost-heave features and surrounding stable tundra. Nine community types were identified in three bioclimatic subzones: dry nonacidic nonsorted circles (10 plots), dry nonacidic dwarf-shrub tundra (5 plots) and coastal nonacidic willow-sedge tundra (5 plots) in the bioclimate subzone C; moist nonacidic nonsorted circles (42 plots), moist nonacidic dwarf shrub-sedge tundra (20 plots) and wet nonacidic sedge tundra (5 plots) in bioclimate subzone D; and moist acidic lichen- and shrub-rich nonsorted circles and earth hummocks (15 plots), moist acidic tussock tundra (10 plots) and wet acidic nonsorted circles (5 plots) in bioclimate subzone E.
The study plots were chosen subjectively in areas of homogeneous, representative vegetation, permanently marked and geo-referenced. For each plant community, the minimum sampling area was determined. At each study plot, the site variables were recorded and a soil sample of the upper 10 cm of the mineral horizon was collected. The raw environmental data were published in a data report (Barreda et al. 2006). The vegetation data were analyzed using the Braun-Blanquet approach, and the plant community types, including three new associations, were published in Kade et al. (2005). Vegetation sampling was conducted during the summer periods of 2000 through 2003 using the centralized replicate sampling procedure (Mueller-Dombois and Ellenberg 1974). The minimum sampling area of the releves was 1 m2 per plot. Cover abundance as well as the cover of plant functional types and the average vegetation height were estimated. Species cover data are published in Kade et al. 2005. Species cover classes are coded according to the old Braun-Blanquet cover-abundance scale: r (rare), + (common, but less than 1 percent), 1 (1 to 5 percent), 2 (6 to 25 percent), 3 (26 to 50 percent), 4 (51 to 75 percent), and 5 (76 to 100 percent). Taxa are listed in alphabetical order. Both the dataset author determinations and the current nomenclature according to the Panarctic Species List (PASL) are listed. 10) Tritomaria quinquedentata (Tritomaria quinquedentata and Lophozia collaris). The source of these data is the Biocomplexity of Patterned Ground Data Report (Barreda et al., 2006). The plot numbers in the source data are the author's. The main plot numbers in the Turboveg database are accession numbers and will differ. The author's plot numbers are retained in the FIELD_RELEVE_NUMBER field in the Turboveg database. At each releve, the following site information was recorded: percent bare soil, percent salt crust cover, cover of standing water, site moisture, glacial history, topography, site stability, and elevation. The maximum snow depths in mid-April 2002 to 2004 and maximum thaw depths in late August 2002 to 2004 were measured using a metal probe. Hyperspectral data were collected between July 19-30, 2006 using a handheld spectraI device. Data were collected preferentially during clear sky conditions and close to midday (10AM-3PM). Collection and processing of the data is detailed in Walker (2011). Above-ground biomass clippings were also taken at each sample location. These samples were sorted by plant functional type, dried at 50 °C, and the dry weight was measured and recorded for each sample. Vascular plants were clipped at the top of the moss layer or at the bottom of the green shoot. Mosses were clipped at the base of the green moss. The soils data for the Frost Boils permanent vegetation plots are modified from the data report in Barreda et al. (2006). At each releve site, the depth of the organic horizon was measured and soil samples of the upper 10 cm of the mineral horizon were collected. Calculation of bulk density and volumetric soil moisture was accomplished by drying field samples at 105º C for 72 hours and determining percentage weight loss. All other analyses were completed on air-dried samples. Particle size was determined using the hydrometer method. Soil pH values were measured using the saturated paste method with a glass electrode pH meter. Total carbon and nitrogen were determined by dry combustion (Robertson et al. 1999). The availability of cations (K+, Na+, Ca2+, Mg2+) was determined with Mehlich-3 extractions (Mehlich 1984). Barreda, J.E., J.A. Knudson, D.A. Walker, M.K. Raynolds, A.N. Kade, and C.A. Munger. 2006. Biocomplexity of patterned ground, Dalton Highway, 2001-2005. Data Report, Alaska Geobotany Center, University of Alaska Fairbanks. 252 pp. Kade, A., D.A. Walker, and M.K. Raynolds. 2005. Plant communities and soils in cryoturbated tundra along a bioclimate gradient in the Low Arctic, Alaska. Phytocoenologia 35:761-820. Mehlich, A. 1984. Mehlich No. 3 extractant: a modification of Mehlich No. 2 extractant. Commun. Soil Sci. and Plant Analysis 5: 409-416. Mueller-Dombois, D. and H. Ellenberg. 1974: Aims and Methods of Vegetation Ecology. New York: John Wiley and Sons. Robertson, G.P., D.C. Coleman, C.S. Bledsoe, and P. Sollins (eds. ): Standard soil methods for long-term ecological research. New York: Oxford University Press. 89-05. Walker, D. A., Kuss, H. P., Epstein, H. E., Kade, A. N., Vonlanthen, C., Raynolds, M. K., and Daniëls, F. J. A. 2011. Vegetation of zonal patterned-ground ecosystems along the North American Arctic Transect. Applied Vegetation Science 14:440-463.